Last night, October 27, MovieNews.Me was invited to the Ayala Malls Cinema's sureseats.com launching where press people and new media enthusiasts gathered together to witness the newly-improved and easier-access website (click here for that blog entry). After the momentous event night of giving information, asking questions, and freebies, the invited guests were also invited to join a cocktail party and exclusive screening of the much-talk about and most anticipated movie of the year: The Social Network. I have heard so much news about this facebook movie months before the actual showing, and I keep myself from reading other movie reviews about this film because I wanted to review it myself prior to reading other movie reviews of The Social Network movie. So, below is my movie review of the film, "The Social Network". 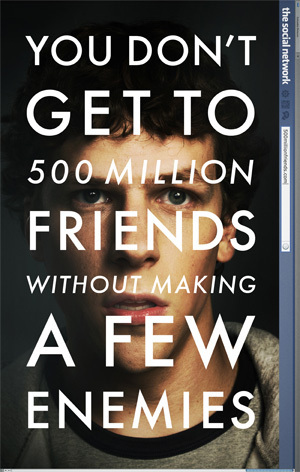 The Social Network takes us back to the year 2003, where the favorite website to hangout with then, was the Friendster and MySpace, and the super geeky and doesn't-care-about-the-money guy, Mark Zuckerberg, was still a college student studying at Harvard University. The movie focuses on the law suites that were filed by Cameron Winklevoss, Tyler Winklevoss and Divya Narendra upon knowing that their ideas where stolen by Mark Zuckerberg and that of Mark's best friend Eduardo Saverin upon knowing that he was double-crossed by Zuckerberg. As you watch the movie, you can feel Mark Zuckerberg's geeky-ness and obsession on what he was doing and on how to improve and expand the then thefacebook.com website. Every line, every moment, and every scene in the movie are very important — you miss one thing, you will not get the whole picture. It's like the "A Beautiful Mind" of 2010 — with depth, intelligent (and geeky) conversations, high-impact scenes — it's an adrenaline rush on a slow-moving choo-choo train. A slow-paced movie packed with so much intense scenes needed in the film. I personally liked the idea on how the whole facebook story is presented. The nonlinear editing of the movie will give us a background on every sides of the story — Zuckerberg's story, the Winklevoss' side of story, Saverin's side of story, among others. Actor Jesse Eisenberg believably acted as a self-centered, geeky guy, and billionaire creator of facebook who does not care for the money at all. All he wanted was to create a website, connect people, and that's it. He reminds me of one of Adam Sandler characters in his past movies. Overall, the movie The Social Network is fun and exciting to watch, very social relevant, and may have get some values on the sides. It is the movie to watch for this new generation of connecting people online. Below is the movie trailer of The Social Network.